Remember when our desi girl Priyanka Chopra became the first Indian to present an award at the 2016 Billboard Music Awards. She looked ravishing in a blue Ateliar Versace gown, didn't she? And what about the sleek ponytail she carried off like a total pro! Remember that? Yes, we still have that look in the back of our mind and today we're going to go back in time and trace the Quantico star's style journey. And to help us with it is the very stylist behind the look - Cristina Ehrlich. She's a name to reckon with, in Hollywood. Having styled the most glamorous Hollywood beauties from Penelope Cruz, Amy Adams, Salma Hayek to Jennifer Garner, Kerry Washington, Lady Gaga (the list can actually go on and on...), it surprises us how earthy she could be as she revealed the secrets to Priyanka Chopra's Billboard Music Award look. "Our first big carpet together was for the Billboard Music Awards, where she wore Atelier Versace..." she tells us. Priyanka Chopra wasn't just a pretty star walking the red carpet but it was one of the many feat PC called dibs on - presenting an award at the music event. So how does PC get ready for a big moment like this. "For this carpet, being a music event, we wanted to strike a balance between something very bold and daring while still maintaining an edge of sophistication," explains Cristina as we ask her about Priyanka's Versace outfit choice. "I think the color, the black strap and the slit were all elements of bold look, while the silhouette read very appropriate for an actress like Priyanka to wear as a presenter." Is it as easy as it seems to walk the red carpet and be flawless like Priyanka Chopra. Apparently not an easy task, but Priyanka palys it cool. And if you want to know the secret to that, Cristina has a word of advice for you: "Always remember that when you go for bold in one area of a look, you should always balance that by paring down other parts. Such was the case with Priyanka's look, wherein we knew that the hair, makeup and jewelry all needed to be sleek and polished." 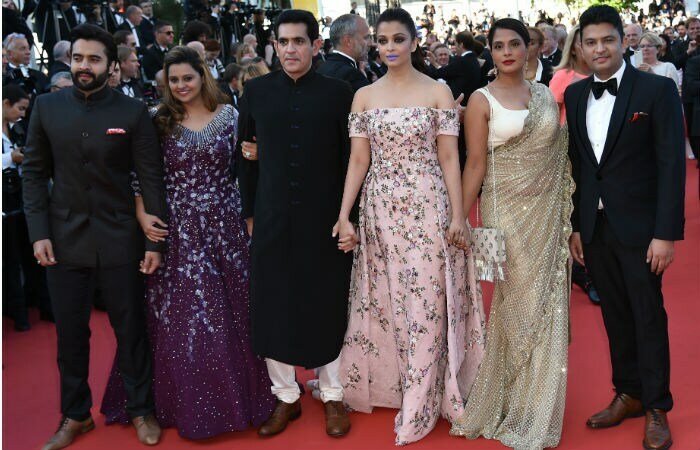 Pats and brickbats for her wardrobe choices have been a part and parcel of Aishwarya Rai Bachchan's 15-year-old Cannes Film Festival journey. The actress said that she doesn't shy away from dressing up, but teases that she may even opt for something as casual as a shirt and a pair of jeans for the red carpet. 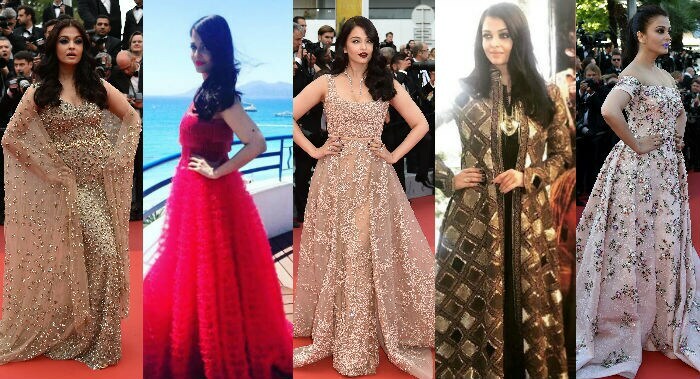 This year, Aishwarya, who is L'Oreal Paris' brand ambassador, began her series of appearances with a glittering gold cape marieprom dress, followed by a ravishing red Naeem Khan number. Thereafter, she looked elegant in a flowing and dreamy Elie Saab creation and then she chose an ensemble by India's veteran designer Rohit Bal. She ended up turning heads when she turned up sporting a purple pout, which took the focus away from her clothes in another appearance. When asked if she feels a constant pressure to look a certain way, Aishwarya, who has worked in international movies like Bride & Prejudiceand Pink Panther, said in an interview: "It has been 15 years at Cannes and I remember coming here for the first time for Devdas and I knew I belonged to showbiz forever. So, playing dress up has become way of life. I don't shy away from it. I keep teasing everyone that one day I am just going to walk out in a white shirt and jeans on red carpet. I always say there are so many opportunities," she said. Fashion, for the 42-year-old former Miss World, is "like art." "It works for some and it doesn't work for some but that's what all the fun is about. It's creative and nice to allow all the professionals to express their creativity," said Aishwarya, adding that she doesn't take it "seriously." "I am an actor by career choice. I enjoy fashion like art and I have a life, I have a family. I am not only focusing on all of this so it doesn't stress me out. I am a professional," she said. Besides, she says she "didn't have the time to personally look at all the choices that the fashion industry was keen on spoiling me with" because she has been caught up with the promotion of Sarbjit, which was screened at Cannes on Sunday. "I really have had a very hectic schedule. So now I am just having fun with all the choices," she said. Since the film fest is one of the most important platforms on the global movie calendar, Aishwarya feels proud that Indian cinema is reaching out to a wider audience. Talking of her own experience at the fest, she said: "15 years is a long time and things are changing. It's changing and the world is getting smaller. The world is (becoming) smaller and access is plenty and easier, so with that, I think our audience is more influenced. There is a lot more awareness, interest and cultural exchange (in our films)." "Our cinema is reaching wider. Our cinema has a wider audience reach. I have looked upon Cannes film festival as a festival that showcases international cinema and largely it's also market for the business," she added. Eva Longoria was the embodiment of glamour as she stepped out in style at Cannes Film Festival on Thursday evening. The actress stunned on the red carpet as she joined the star-studded crowd at the Monkey Makers premiere in the south of France this week. Eva completed the look with a beautiful diamond necklace. It comes after the star enjoyed a boozy evening with BFF Victoria Beckham following the opening ceremony . The brunette beauties go way back, so it's no surprise that after hitting the red carpet on the first day of the event, they they headed to the Martinez hotel, where the former Spice Girl was hosting a party for her pals. It comes after Victoria showed off her nifty new party trick - flaunting her flexibility by kicking her leg into the air . It's been a good few weeks since the fashion designer last revealed what her perfect pins were capable of , but she was back to doing her thing when she hung out with BFF Eva Longoria after Cannes on Wednesday. A cheeky snap showed Posh - still wearing her monochrome ensemble - as she pointed her stiletto into the air. Meanwhile Eva was just looking on in the background, making no attempt to match her pal's flexibility.